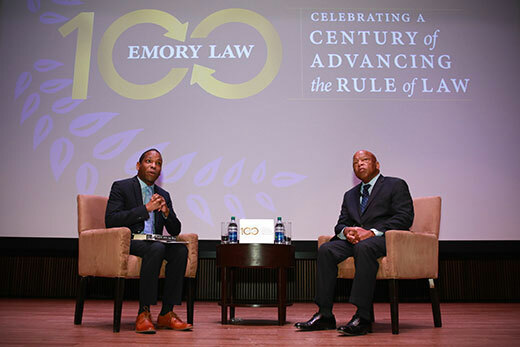 U.S. Rep. John Lewis (right) joined in a conversation with Emory Law professor Fred Smith for a March 22 event at the National Museum of African American History and Culture celebrating the law school's 100th year. “As long as there is an America — and I think we’re going to be around for a while — this museum will tell the story and the struggle and the history of a people who never gave up and never gave in; they kept dreaming," U.S. Rep. John Lewis (D-Ga.) told the audience gathered at the National Museum of African American History and Culture to celebrate the centennial of the Emory University School of Law. At the March 22 event in Washington, DC, Lewis talked with Emory Law alumni and assembled guests about the campaign to establish the museum — a campaign that he helped lead when he first co-introduced legislation for it in 1988. Robert A. Schapiro, dean and Asa Griggs Candler Professor of Law, answered Lewis’ call to action and posed his own questions about the future direction of Emory Law, saying that the school is poised to take on an even larger role in addressing the country’s present and future legal concerns. During the event, Schapiro also announced that the school’s John Lewis Chair for Civil Rights and Social Justice has been fully funded through gifts and pledges, allowing the school to conduct a national search for a scholar with an established academic profile of distinction and a demonstrated desire to promote the rule of law through the study of civil rights. In 2015, Emory Law received an anonymous $1.5 million donation to help establish the John Lewis Chair. The law school then committed to raise an additional $500,000 to fund the chair fully, meeting that goal in early 2017. Lewis has dedicated his life to protecting human rights and securing civil liberties. In 1963, at the age of 23, he was a keynote speaker at the historic March on Washington. During the height of the civil rights movement, from 1963 to 1966, Lewis was named chairman of the Student Nonviolent Coordinating Committee (SNCC), which he helped form. In 1965, he was beaten as he led protesters trying to cross the Edmund Pettus Bridge for a voting rights march from Selma to Montgomery, Alabama. He has served in Congress as representative of Georgia's Fifth Congressional District since 1987. Within the museum there are stories told of many who, over the years, took the opportunity to be bold, including those who did it through famous litigation, such as Plessy v. Ferguson, Brown v. Board of Education and Loving v. Virginia. There have been approximately 1.2 million visitors to the museum and it has hosted numerous influential groups since opening in September 2016, including 15 National Basketball Association teams, several Academy Award winners and, now, Emory Law.